From Illumination Entertainment, the studio that brought you The Secret Life of Pets comes an animated comedy about finding the music that lives inside all of us. 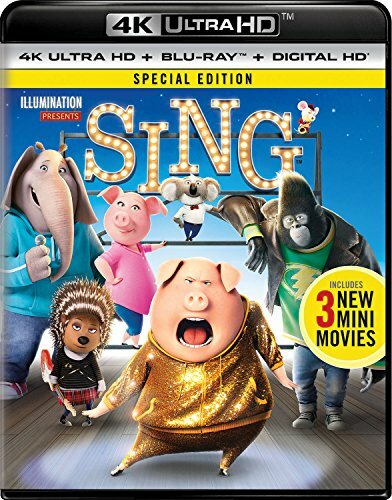 Sing stars Academy Award winner Matthew McConaughey as Buster Moon, an eternally optimistic koala who puts on the world's greatest singing competition to save his crumbling theater; Academy Award winner Reese Witherspoon as Rosita, an overworked and underappreciated mother of 25 piglets desperate to unleash her inner diva; Scarlett Johansson as Ash, a punk rock porcupine with a beautiful voice behind her prickly exterior; and Taron Egerton as Johnny, a young gangster gorilla looking to break free of his family's felonies. Sing is the musical comedy event of the year!